I am sitting in my favorite spot on the back porch, with my feet propped up, watching the kids play. Hannah and I just read a "Ladybug" Magazine together in her clubhouse and then I pushed Joseph on the horsey swing. It was supposed to rain all day, but that didn't happen, so we are enjoying the overcast day, driving jeep/tractor around the yard, not having to worry about sunscreen or being too hot. And now here I am with my laptop under the nice breeze of this porch fan. The not-so-gentle tug of my to-do list and all the things I should probably be doing comes to mind. I have calls to make, notes to write, errands to run, things to clean. I have loads of emails to go through. I'm not really interested in doing any of that, though. Maybe I shouldn't be doing any of that. 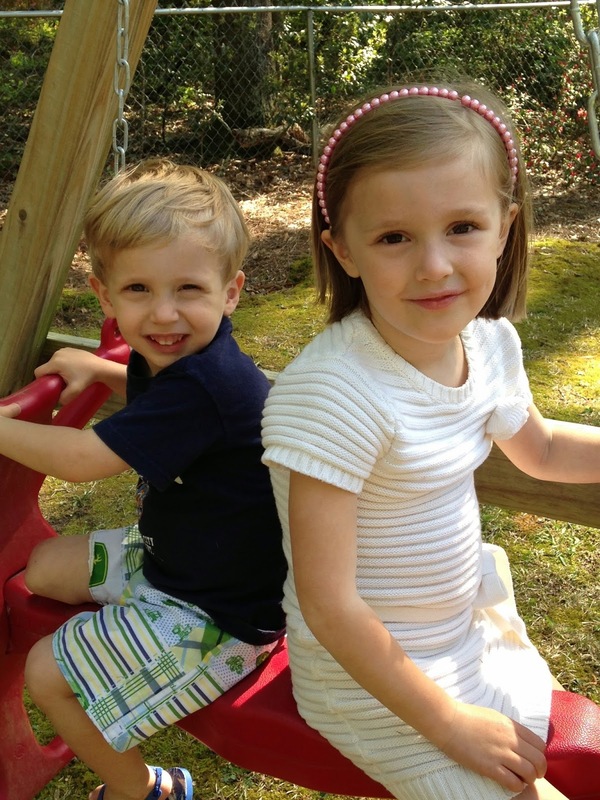 Maybe I should just continue on, enjoying my time with these two, while they're still little and so much fun. But, here I am, like I said, with my laptop now. 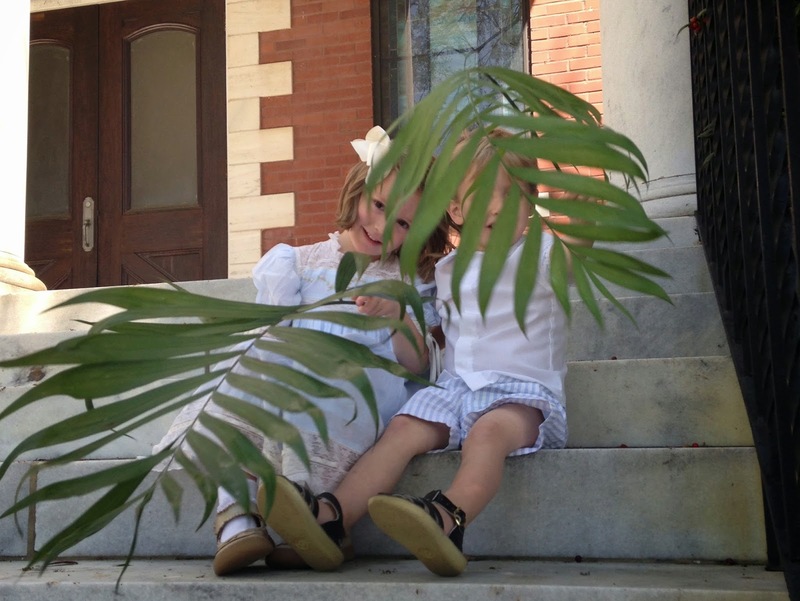 Attempting to go through pictures and focus long enough to get at least part of the last 10 busy days on the blog. We've had a lot going on. The day after Joseph's birthday, my brothers and their wives came to town. 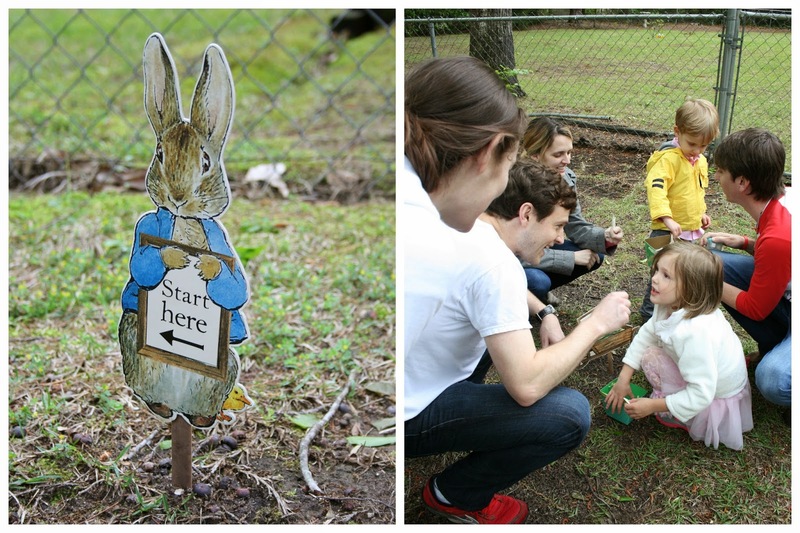 We dyed eggs, decorated mini bunny cakes, had a scavenger hunt, and played for hours in the backyard. 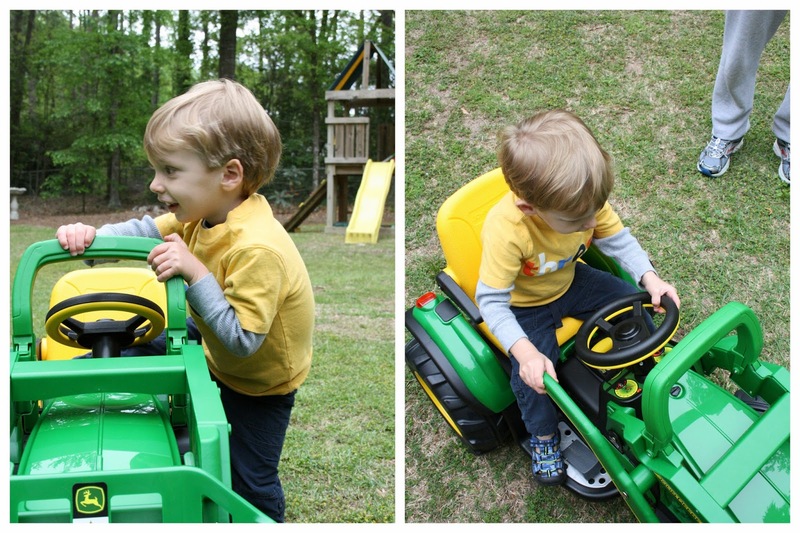 Joseph loved showing off his new tractor. 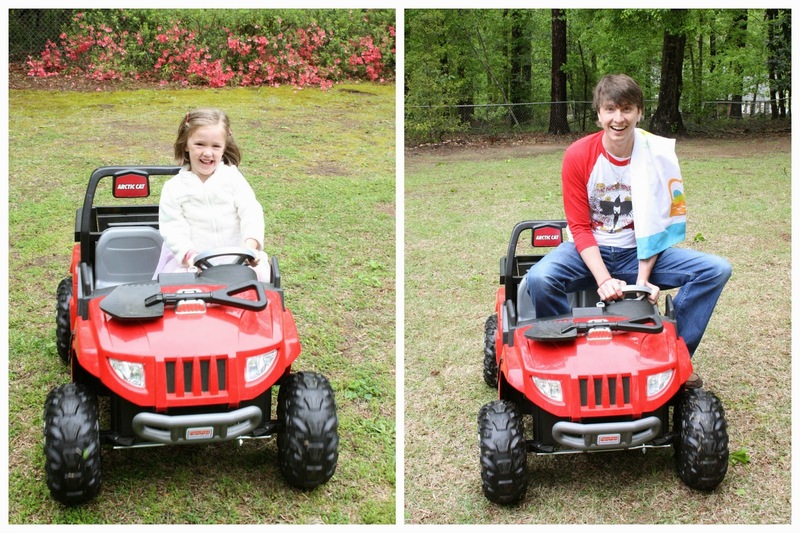 Hannah drove the Jeep, chasing everyone around. It was so much fun. My mom set up this little scavenger hunt around the yard. Team Hannah and Team Joseph raced around, following signs and directions (hop this many times, run this many circles, do this many jumping-jacks…) and getting treats. They loved it. For dinner we went to Puebla's for Mexican. 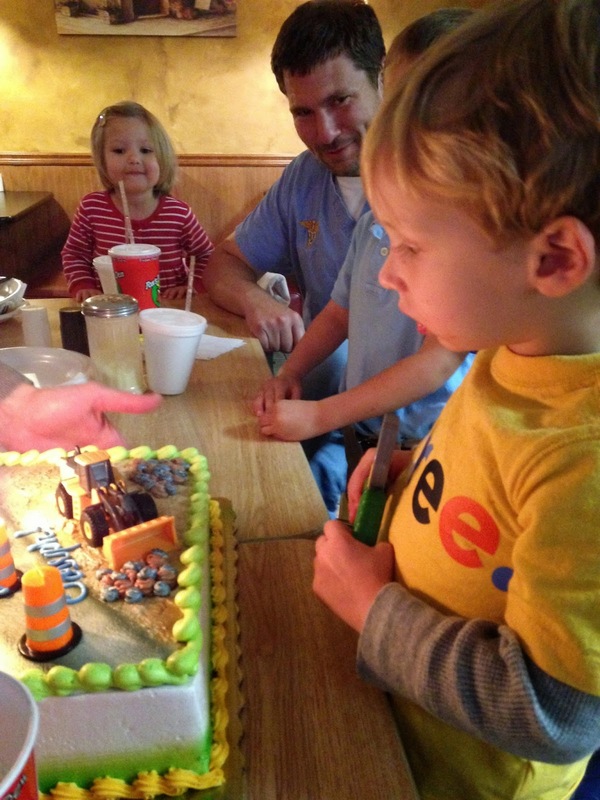 It's one of Joseph's favorite places, and we were still celebrating the birthday boy. 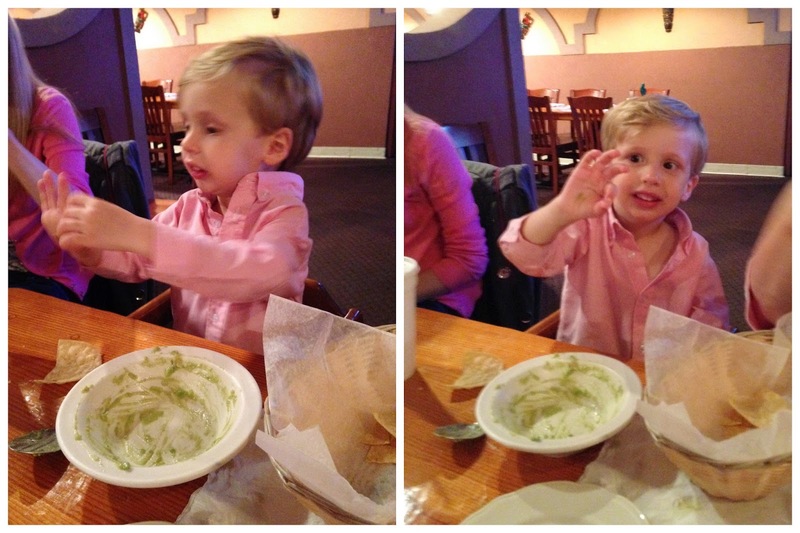 He ate up a bowl of guacamole. This is blurry, but I had to take pictures of him showing me how old he was now. It takes two hands, and a little bit of effort, but he gets it eventually. 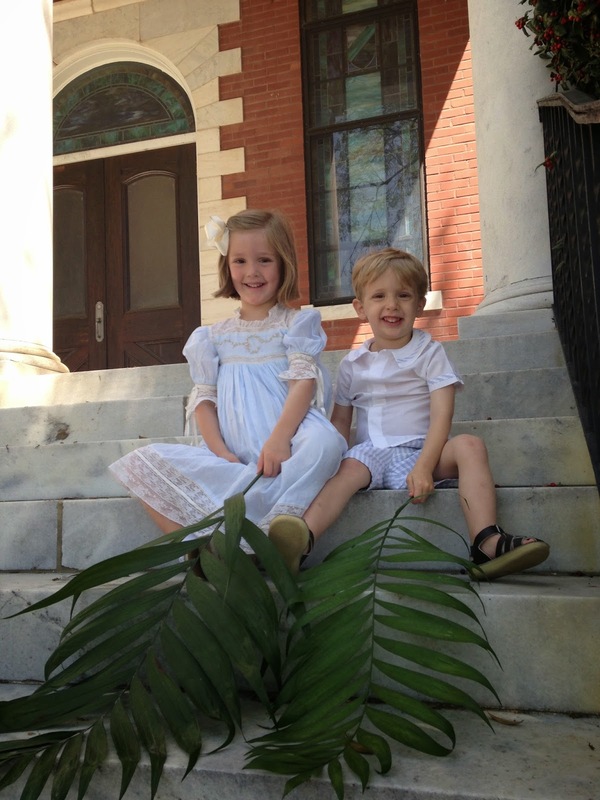 Easter morning came and Ben, my older brother, and I went to Joe's sunrise service on the front lawn of the church. It was nice, although a little chilly. Such a great way to begin the most important day of the year. 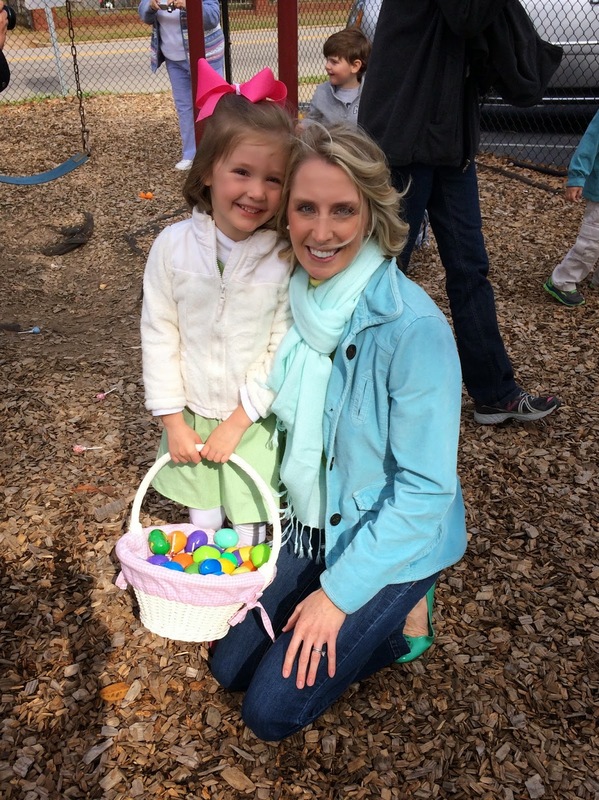 I love Easter and the celebration of what is the foundation of my faith. We went home and made "Empty Tomb" rolls. 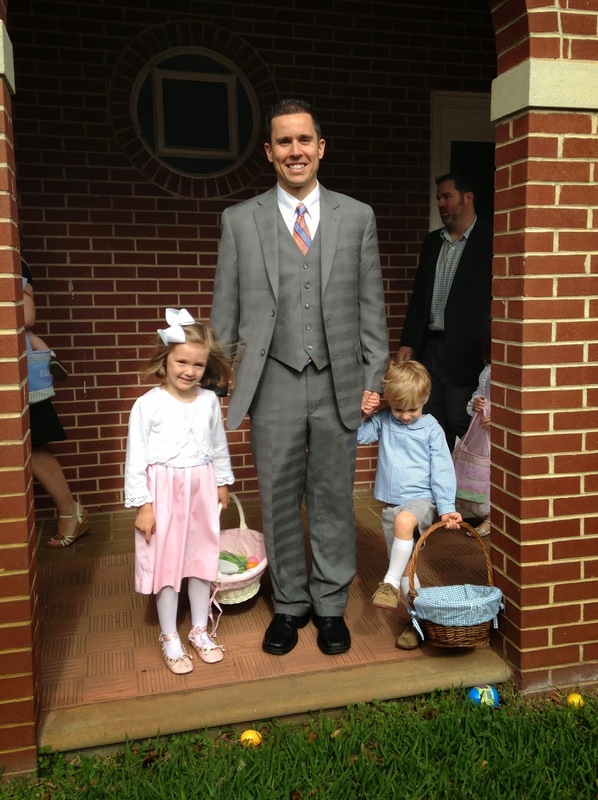 I wanted to do something on Easter morning with the kids that was about Jesus. 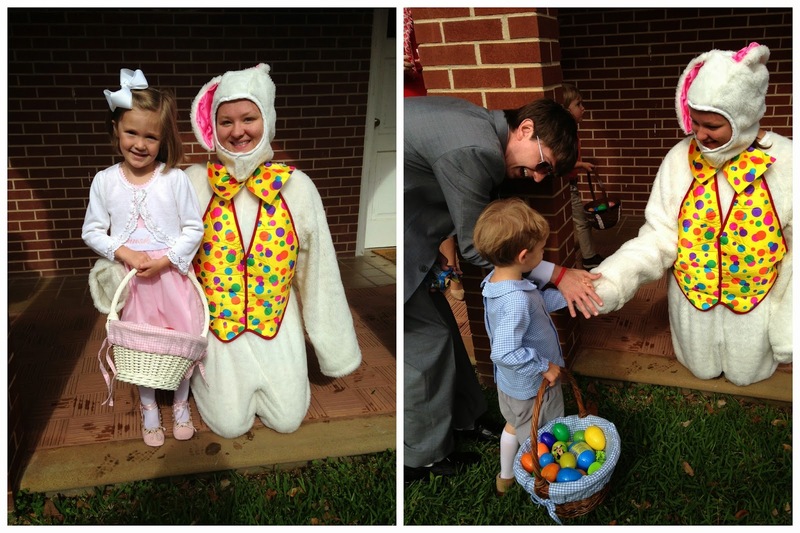 It's not about the bunny…it's about the lamb. We heard about this idea recently from one of my aunts. You roll a marshmallow in a cinnamon/sugar/butter mixture and fold inside a crescent roll, making the shape of a box, or "tomb". Once it's baked, you break open the roll and it is empty inside - the marshmallow is gone. I love the symbolism and visual it gives a child. Joseph is a little young to understand, but Hannah seemed to like it. And they tasted delicious, too. 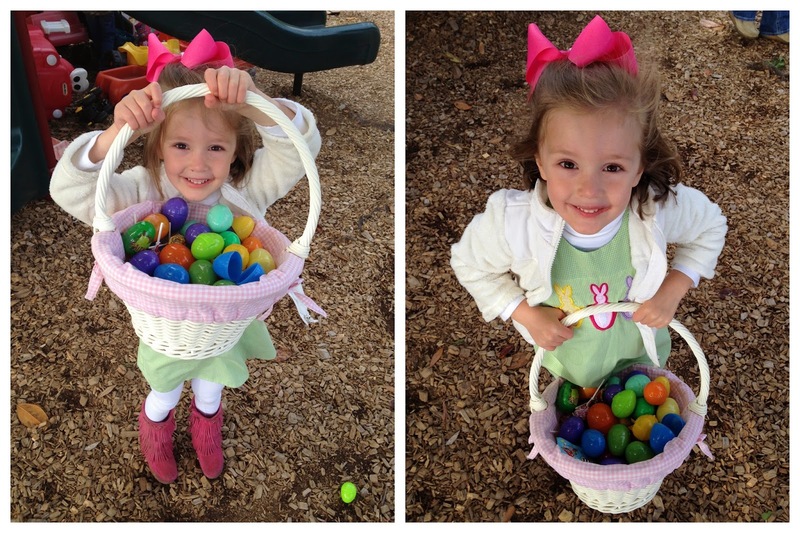 Daddy came home and the kids saw their Easter baskets. 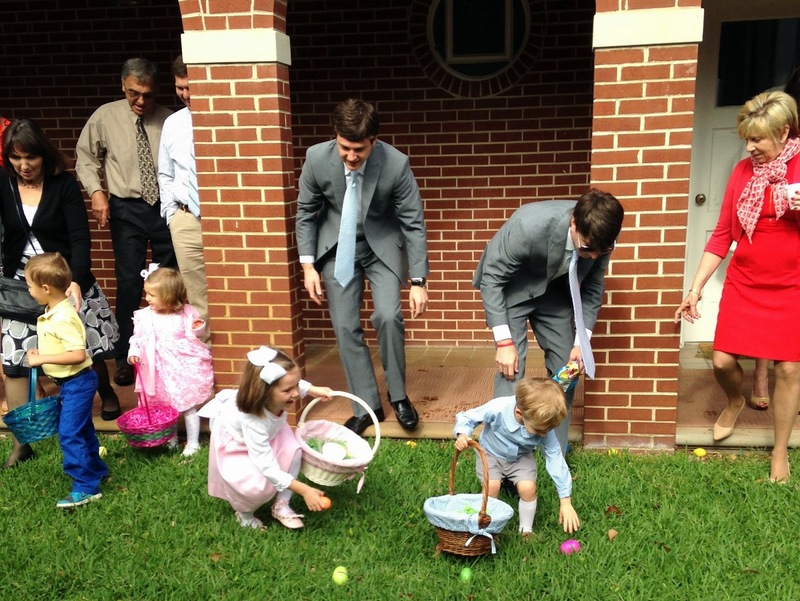 Then, it was time to head to church for the egg hunt. 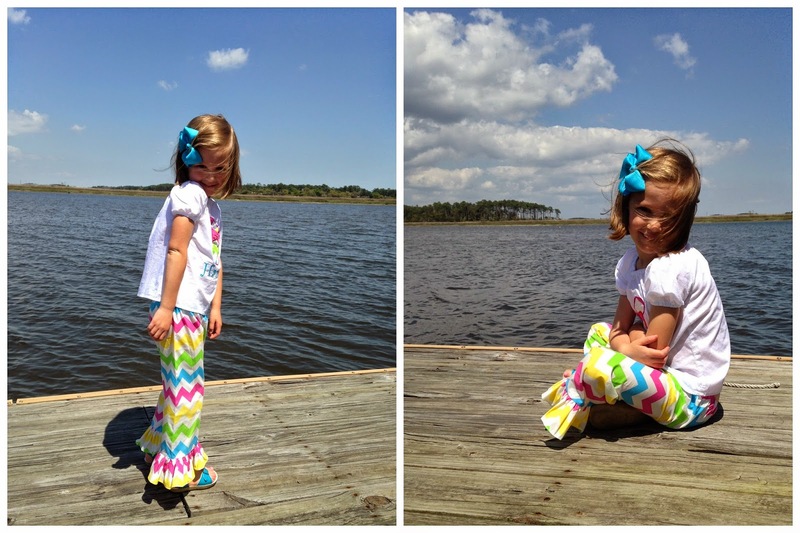 They were excited, and Hannah was so happy to be wearing her new fancy flowery ballets. 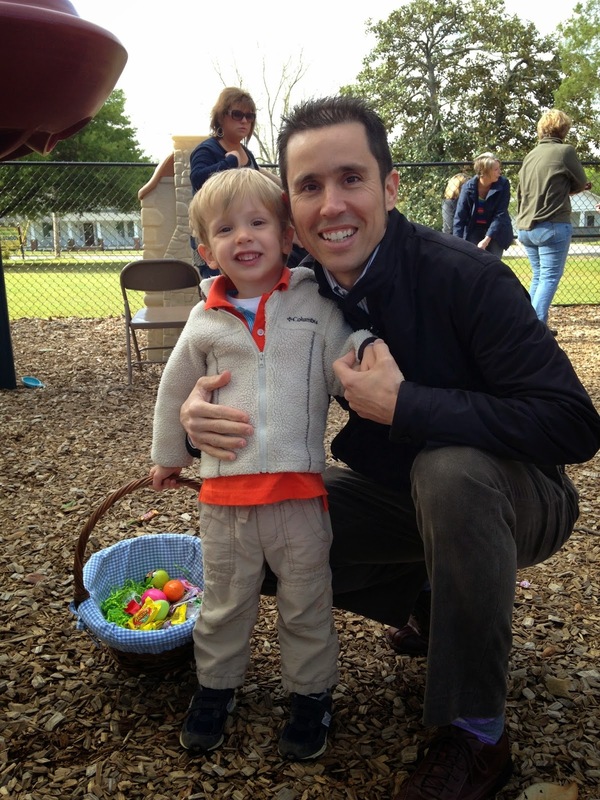 Uncle Ben and Uncle Will Will were just as excited to hunt eggs. 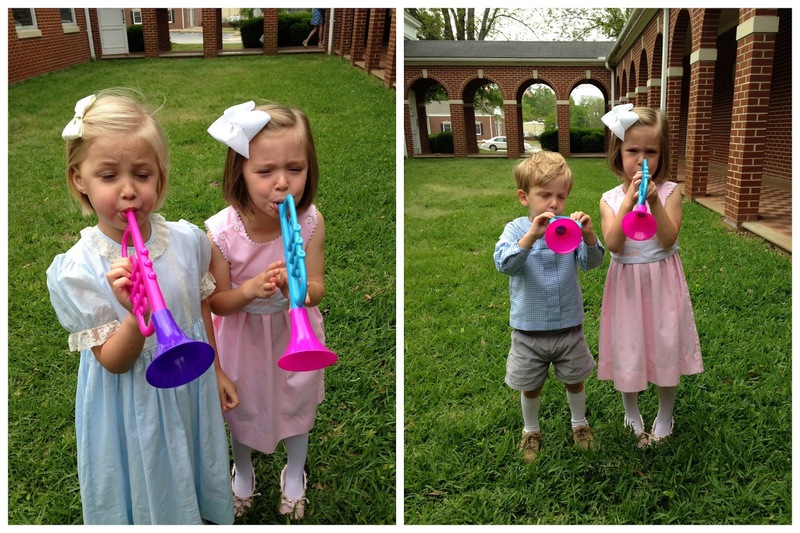 Hannah was so protective of him and they were precious as they all blew their Easter Sunday trumpets. But it was more than that…way more. Rev. 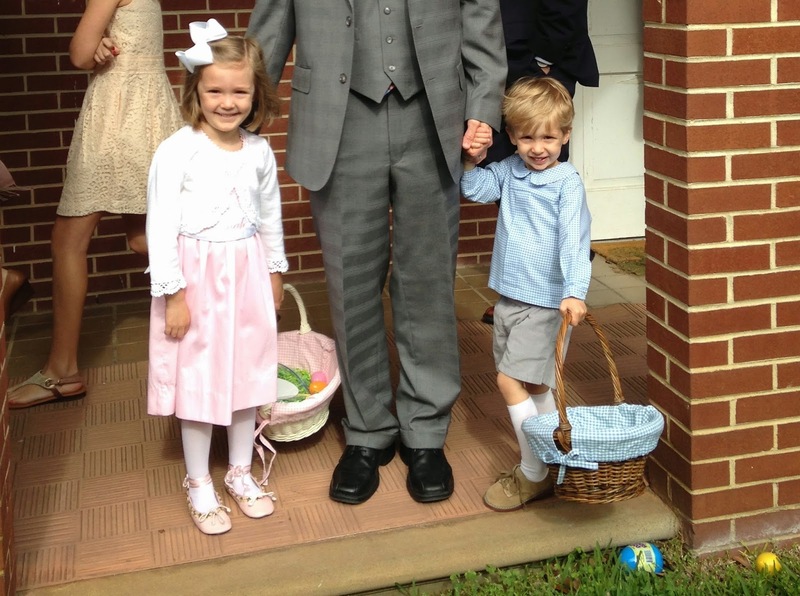 Sid, the retired pastor in our church (who so graciously filled in after Joe's accident) told the children about our church's own "Easter miracle" - and that miracle was their pastor. Hannah and Joseph's daddy. My husband. How he survived being hit while riding his bike last summer. 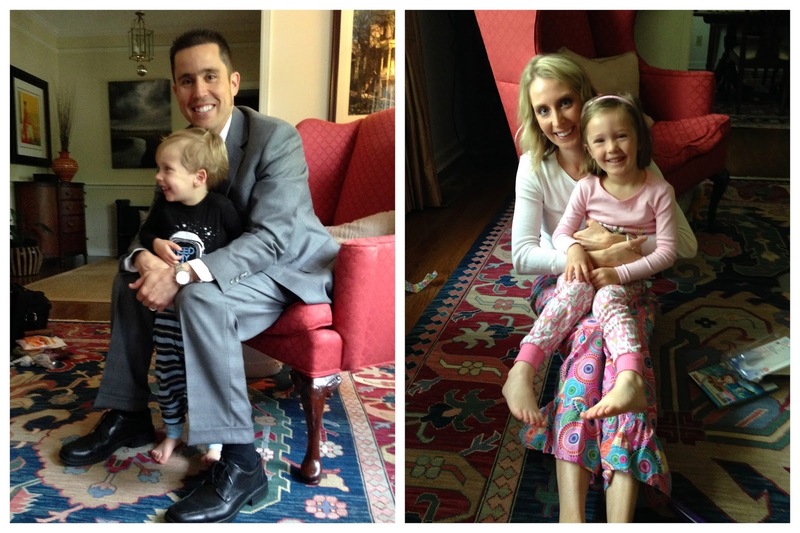 How he is recovering and doing well… And how he was flying out - that day - to go to Boston, to run the Boston Marathon. Joe was crying. I was crying. Everyone was clapping. I was so proud, yet humbled. And thankful. Then it came time for the sermon, and as Joe preached about being made a new creation in Christ Jesus and how part of us has to die - to be changed - to become the person God wants us to be, the tears fell again. God's plans are not always our plans. We have to let go of our will, and submit to God. Things happen and circumstances change. We may never be the same. Spiritually, mentally…or physically. Oftentimes we have to be broken to be made whole. Since Joe's accident, he has been changed. Our family has been changed. We will never be the same. But we are covered in God's love. His promises are always true. Because of him we have hope. We have purpose. None of us deserves anything. God does not owe us anything. But he gave us the greatest gift: his son. Jesus willingly gave his life so that we could live. And then he rose. And if we believe in him, and live for him, we will have everlasting life. We are all in need of a Savior. He is the Easter Miracle, and that is the good news. Well, it's Wednesday. I obviously did not finish this post on the back porch yesterday afternoon. And I still have a lot more to catch up on. 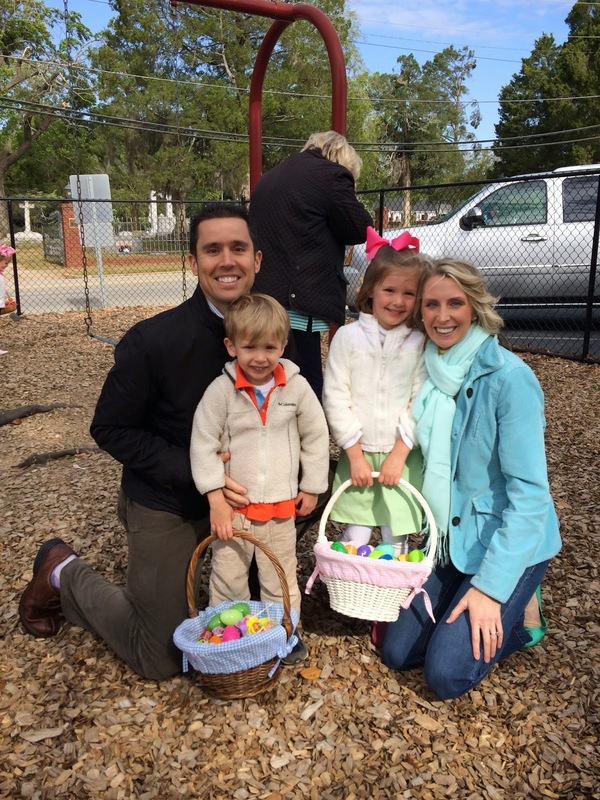 To finish out the weekend, our family left church on Easter, packed the car and drove to Atlanta to catch a plane for Boston. I have about 300 pictures to go through. 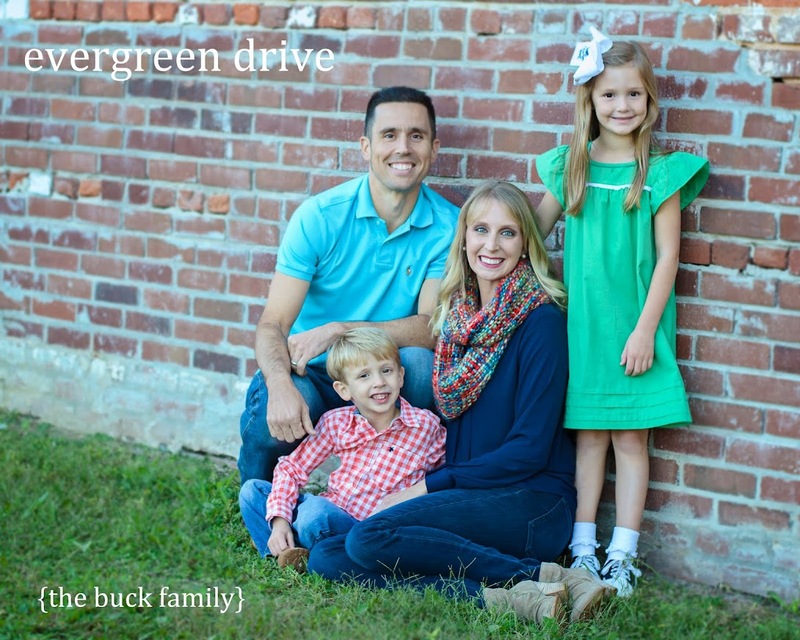 PS: I know some of you already listen to Joe's sermons, but for the others - you can search Sandersville UMC on iTunes and find them! Easter Sunday's message is titled "Snow White and the Seven Dwarfs: Happy" and is the last in a series. You can also find it on the church's website: www.sandersvilleumc.org and click on the podcast link on the right. You don't necessarily need to listen to the previous six if you just want to hear his Easter message. This has been a different kind of Holy Week. 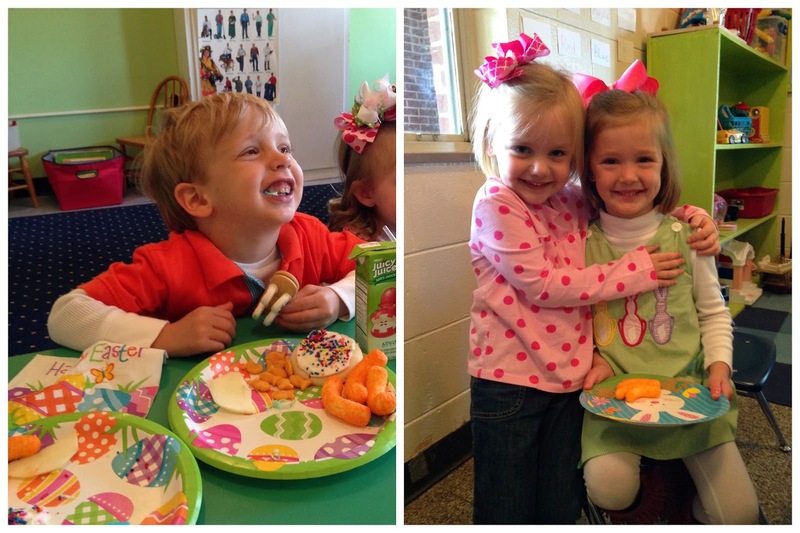 As usual, the preschool had their Easter parties and egg hunt on Thursday. 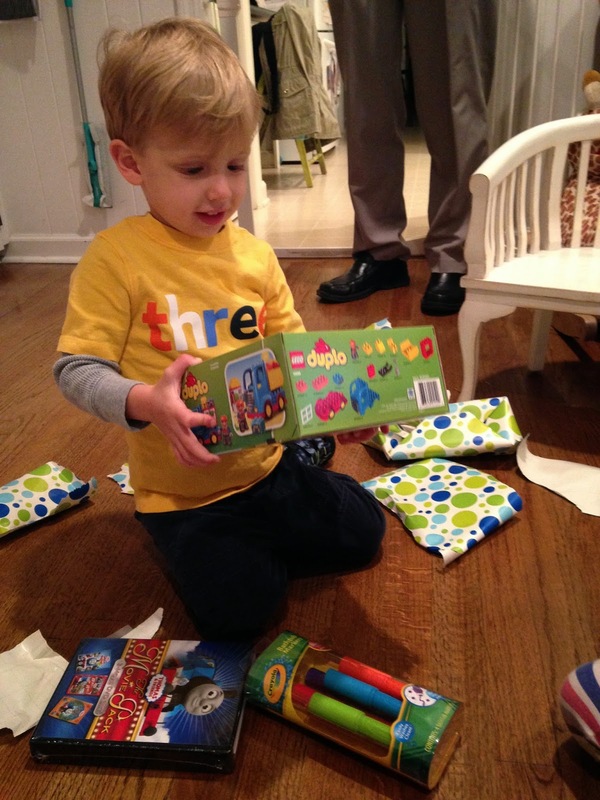 We celebrated Joseph's third birthday on Good Friday. 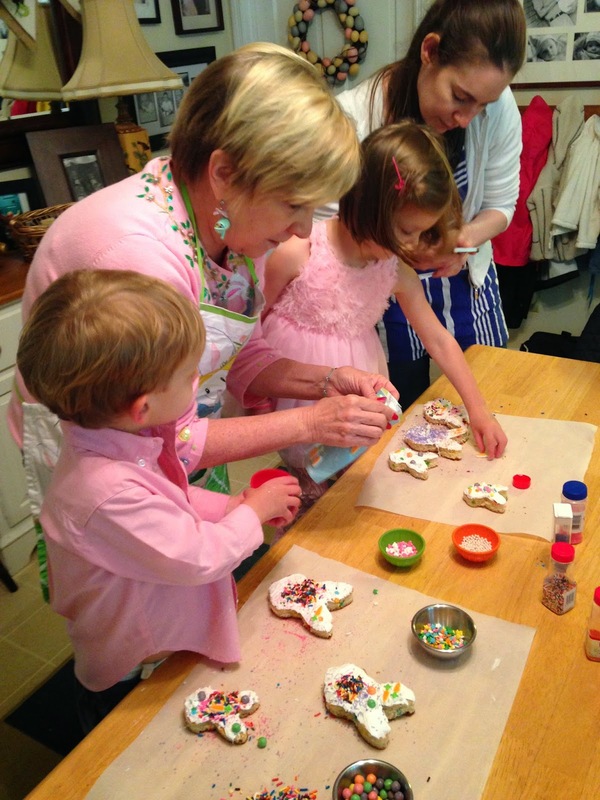 It was challenging to celebrate something wonderful and commemorate a very holy day all at the same time. We compartmentalized, I guess. 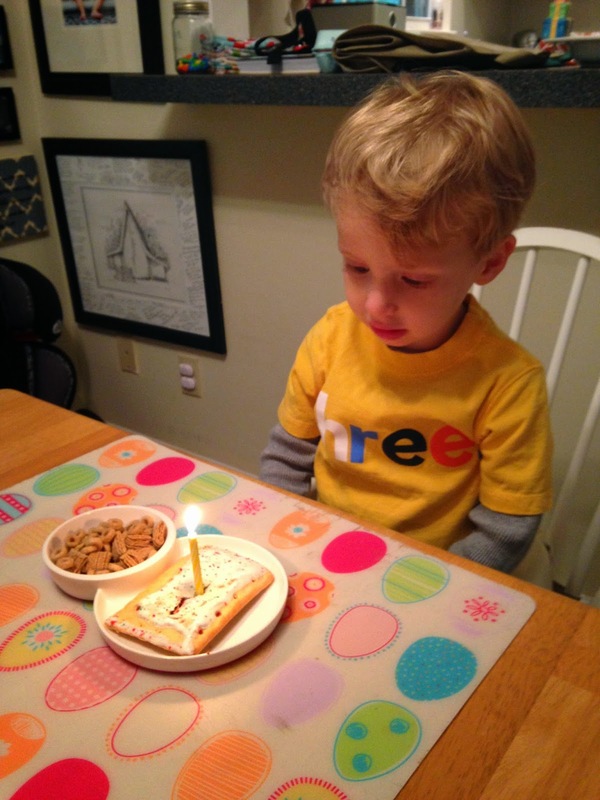 He had a candle in his pop tart at breakfast and we went out for pizza (his favorite) for dinner and did cake. But, before all that. 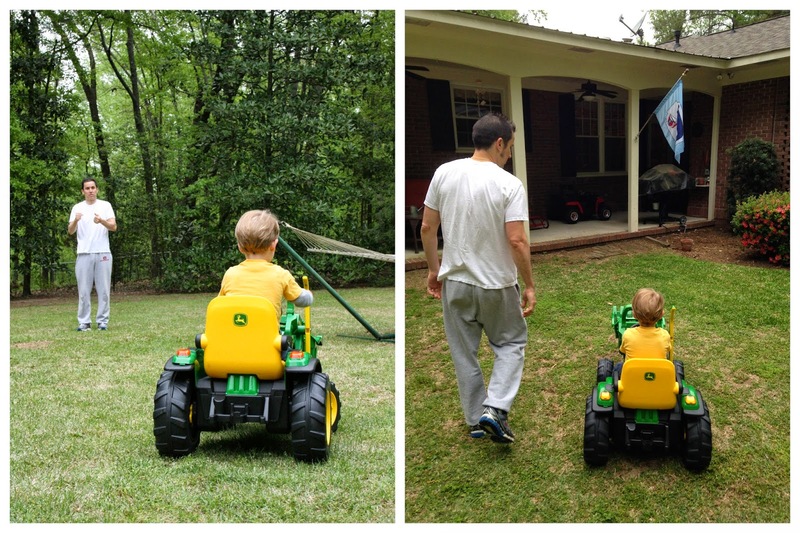 He got a tractor. We were very glad we took advantage of the morning, because when we came in for breakfast it started raining. And it didn't stop. All Joseph could talk about was his tractor. For. the. rest. of. the. day. To say he loved it is a major understatement. I guess the rain was appropriate for such a solemn day. But my three-year-old could not understand why it wouldn't stop raining so he could go outside. But, he had a good day. 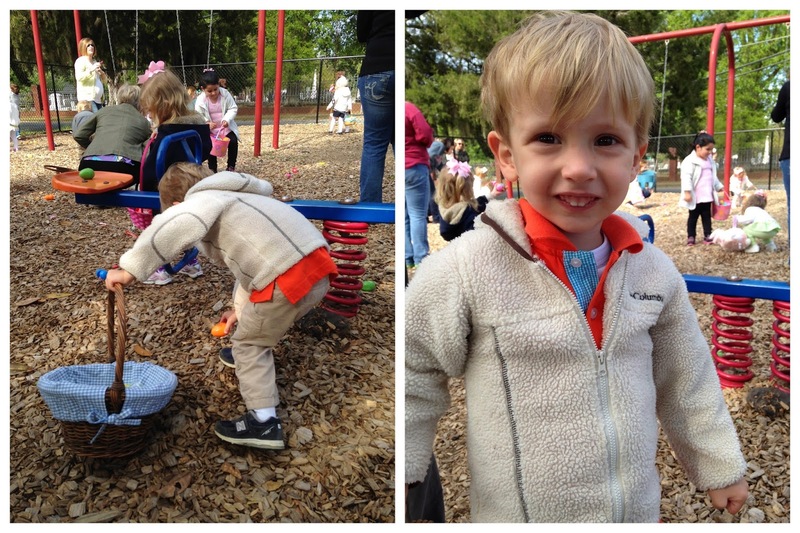 Thankfully, he got plenty of time to play when his aunts and uncles came to town the next day. More tractor pictures to come! 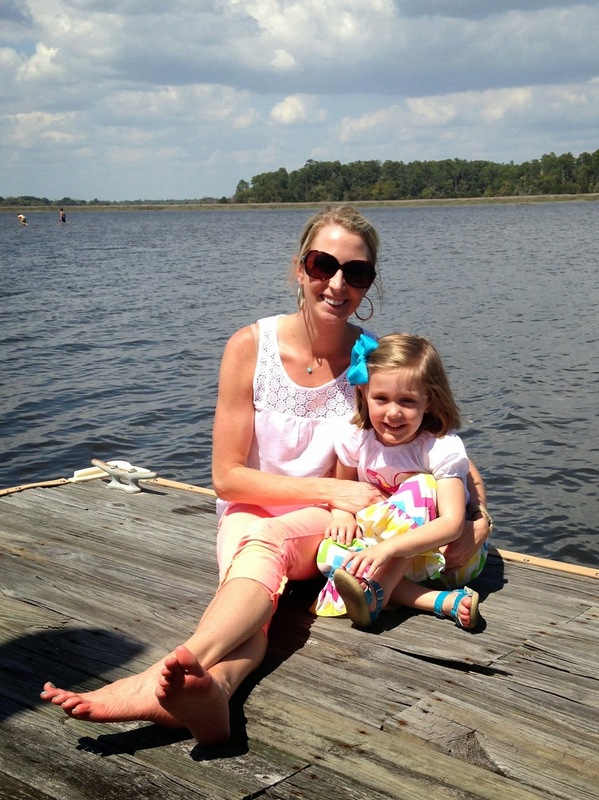 This past weekend we were back in Savannah. But let me back up. 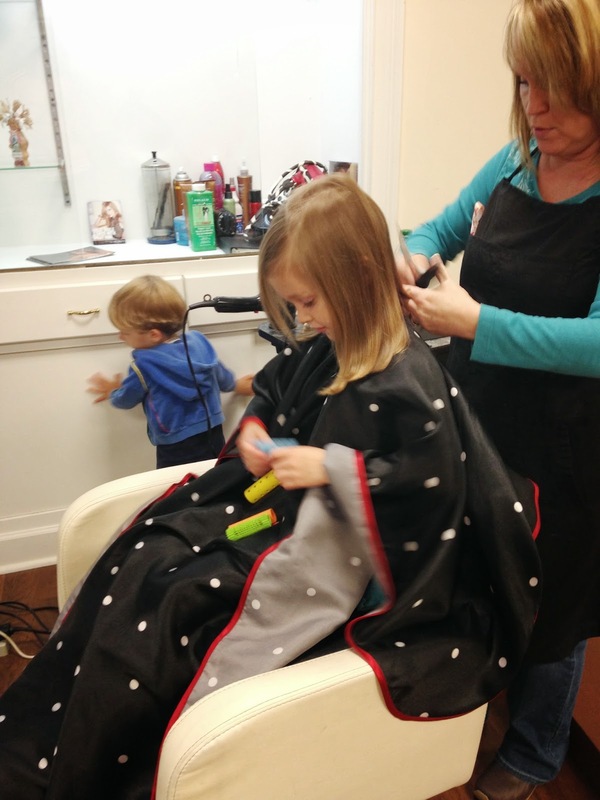 Before that, Hannah Banana got a haircut (in case you missed the picture on Instagram). 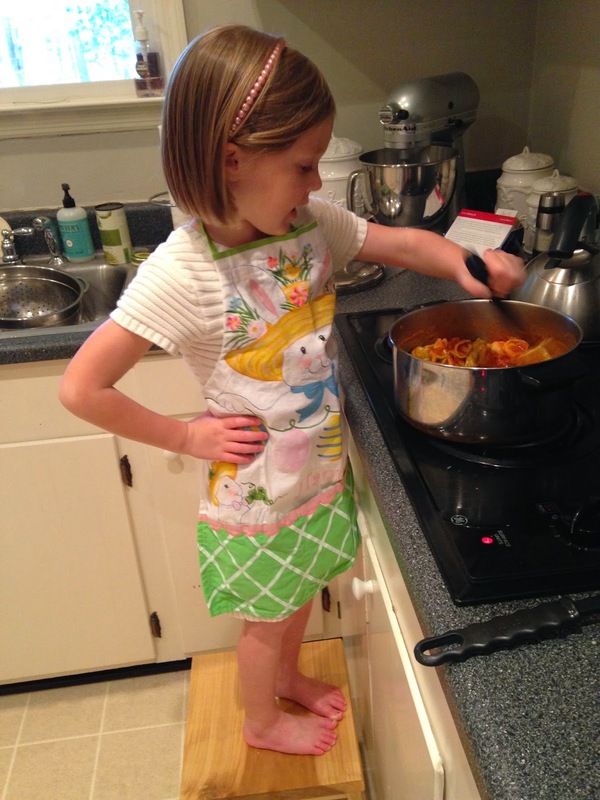 That night, she helped me make dinner. That's right, you read that correctly. I made dinner. I love the sass. We made chicken tortellini. And I appreciated the help from my little cutie pie. Friday we went to Savannah, this time for about 30 hours. We had a great time out to dinner with my mom's side of the family, and then Saturday afternoon, enjoyed beautiful weather at Joe's parents' house on Moon River. 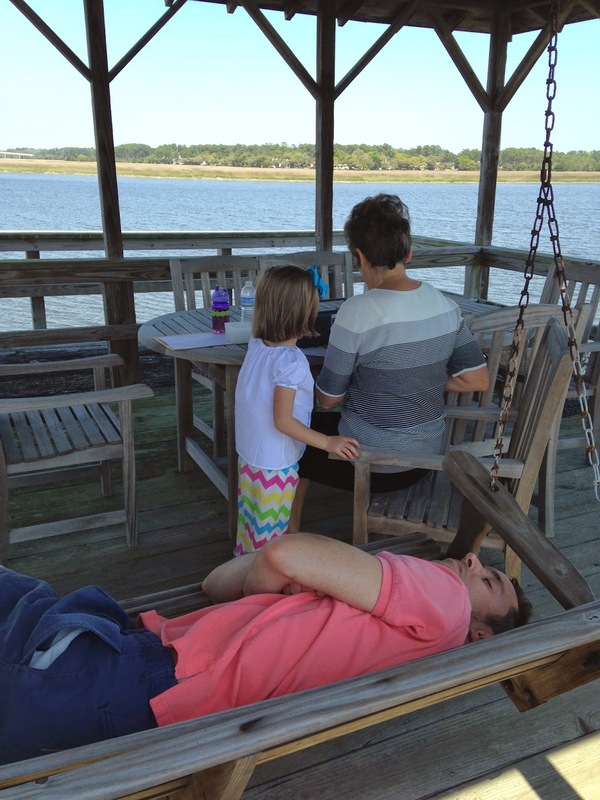 While Joseph napped, we played on the dock. 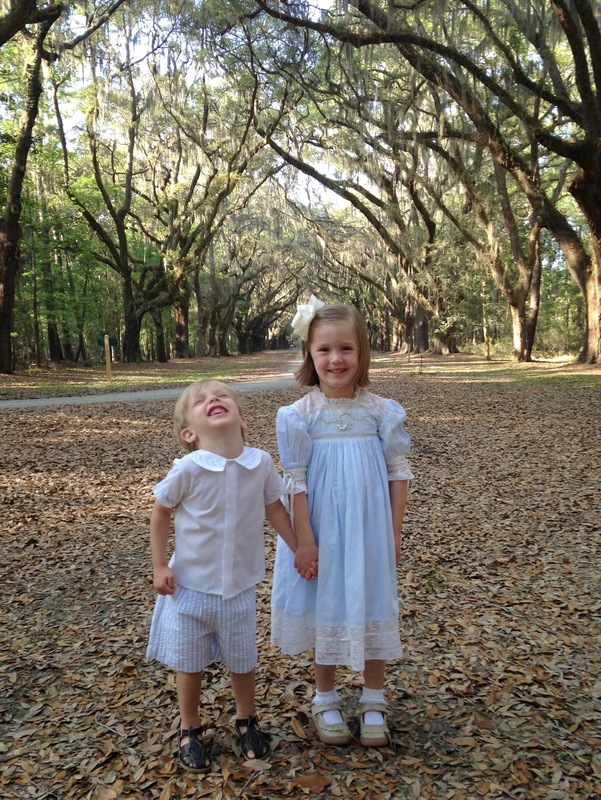 We went to a cousin's wedding at Wormsloe Plantation. In my opinion, one of the most beautiful places and so home to me, so Savannah. The oak-covered drive is just gorgeous with the Spanish moss hanging from the trees. I had to take a picture through the windshield. Unfortunately, because of that thick canopy, gnats can get pretty bad. But we had bug spray. 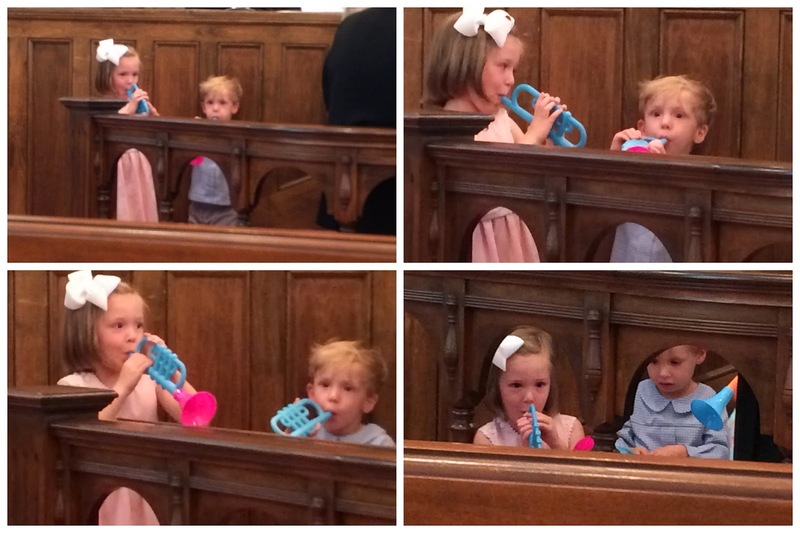 And the kids were happy enough. We got back home to Sandersville about midnight. 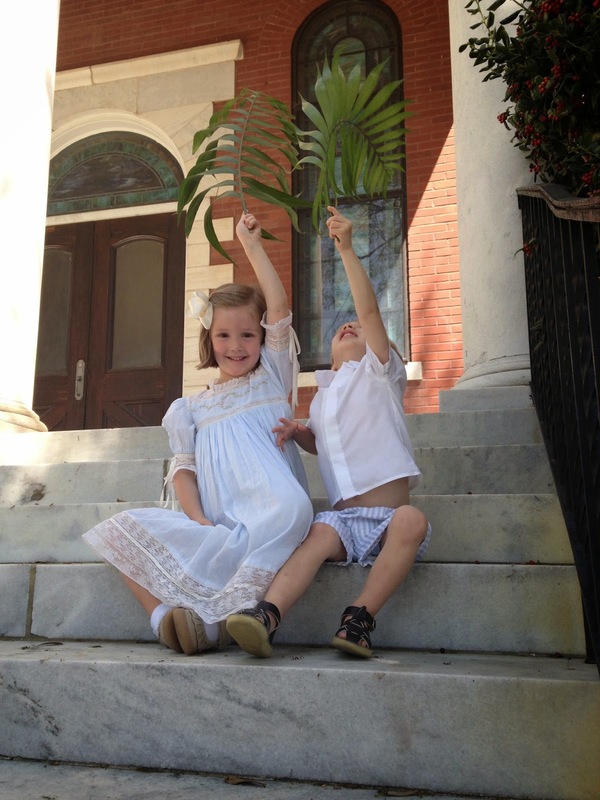 Sunday, I dressed the kids in the same clothes, and we celebrated Jesus' triumphant entry into Jerusalem by waving our palms at church.